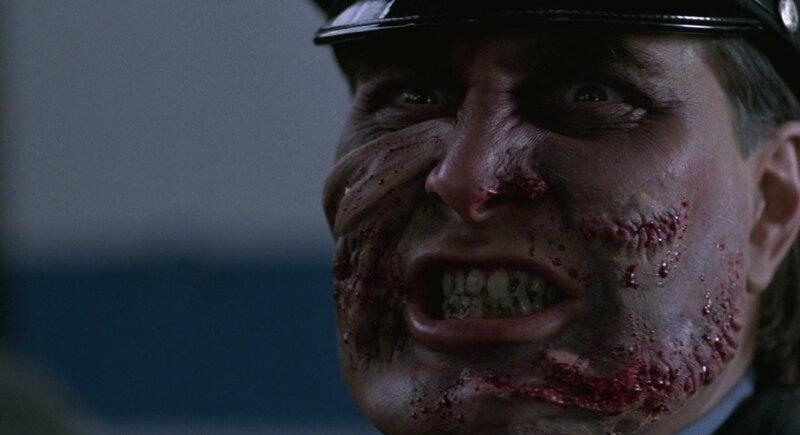 Maniac Cop (1988) Review – AiPT! I’ve worked at quite a few video stores in my time, which is probably why my DVD collection is so massive. I had the “luxury” of working at a Blockbuster Video in 2001, which was the year they made their big transition from VHS to DVD. We threw out literally hundreds of tapes; so many, in fact, that we didn’t have the hours or manpower to smash them all with a hammer before disposal, which was standard Blockbuster protocol (wasteful, I know). Blockbuster was a pretty crappy place to work, but on rare occasions it provided some welcomed perks. During the “big upgrade”, I got to take home quite a few discarded videos, mostly horror films that weren’t yet available on DVD (and which still aren’t available on DVD). One of those purloined gems was Maniac Cop, a surprisingly decent late 80s slasher flick that boasted a most unexpected duo of B-movie icons. Officer Matt Cordell (Robert Z’Dar) was a good New York City cop who was fed to the scum of Sing Sing on some bogus charges by a cabal of corrupt politicians. Seemingly back from the dead, Cordell now prowls the streets of Manhattan as the unstoppable Maniac Cop, killing innocent people instead of protecting them. Detective Frank McCrae (Tom Atkins) is the only member of the force who suspects Cordell might still be alive and takes it upon himself to track the killer down. His duty becomes hindered, however, when Officer Jack Forrest (Bruce Campbell) is mistakenly identified as the Maniac Cop and is sent on the run. The 80s were the Golden Age for slasher flicks, but it seemed that for every quality movie that was offered, ten absolutely dismal abominations were churned out alongside it. By the end of the decade, the subgenre had pretty much collapsed in on itself thanks to extreme oversaturation. So imagine my surprise when a slasher movie from nearly the end of the 80s (1988, to be precise) turned out to be so good. Maniac Cop certainly follows much of the formula that had killed the subgenre, but the concept proved creative enough to inject some much needed originality into the mix. Instead of having victims running away from the killer, they actually run to him, since hey, you’re supposed to trust cops, right? This idea changes things up enough to keep the film more fresh than not. I suppose if Maniac Cop had one major flaw it would be that the kills themselves aren’t too exhilarating. A lot of stabbings and slit throats and stranglings… Nothing to see here. The endless Friday the 13th sequels may have been the definition of “formulaic”, but at least the kills were creative. But that’s okay, because to make up for the lack of creative kills, you’ve got two 80s horror icons in starring roles. Tom Atkins was probably the most unlikely leading man in cinema history. Not especially young, handsome or physically fit; he looked more like a math teacher than an action hero. And yet he starred in so many 80s horror flicks that he must have been doing something right. Maniac Cop came at about the zenith of his career, but it’s a good enough note to end on before spiraling into Hollywood obscurity. The other 80s horror icon in this flick is, of course, none other than Bruce Campbell. The man is the best good bad actor I know of. If Maniac Cop has anything else going for it, it has to be the setting of New York City. That may not sound very impressive, but most of the movie, if not all of the movie, is actually shot in New York City. The majority of films that take place in the Big Apple have most of their footage shot in Canada or Australia and at times it can be really obvious. Maniac Cop revels in its New Yorkness, which gives it a wonderfully gritty, urban atmosphere. When it comes to slasher flicks, finding a good one is like searching for treasure in a trashcan. Still, sometimes, you do strike gold.